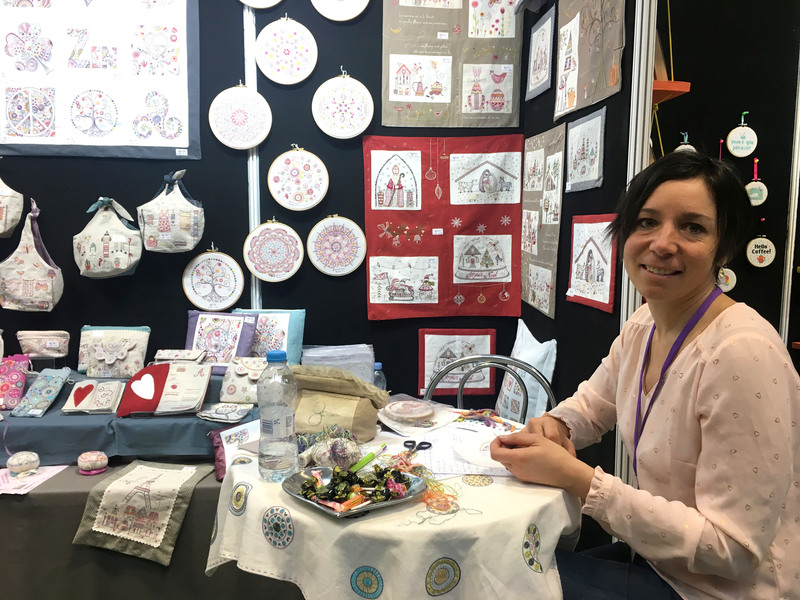 I was up in Birmingham last week to attend CHSI Stitches – one of the largest craft trade fairs in Europe. 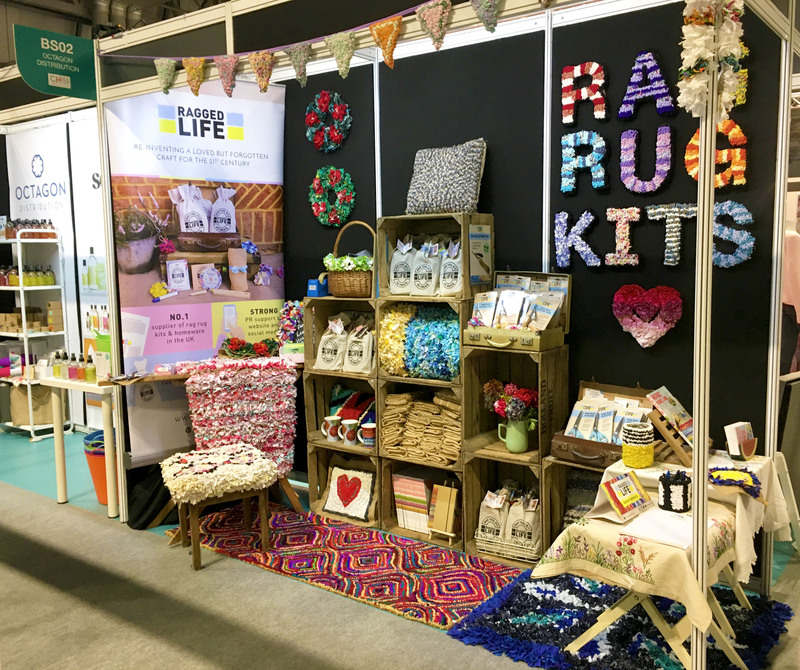 Although I was there with my Ragged Life wares to sell my kits and tools into craft shops, department stores and garden centres all across the country (yes, I’m trying to start a rag rug revolution), I did take a little time out of my busy days to look around the show and see what cool new things are coming up in the world of craft – don’t say I don’t treat you! 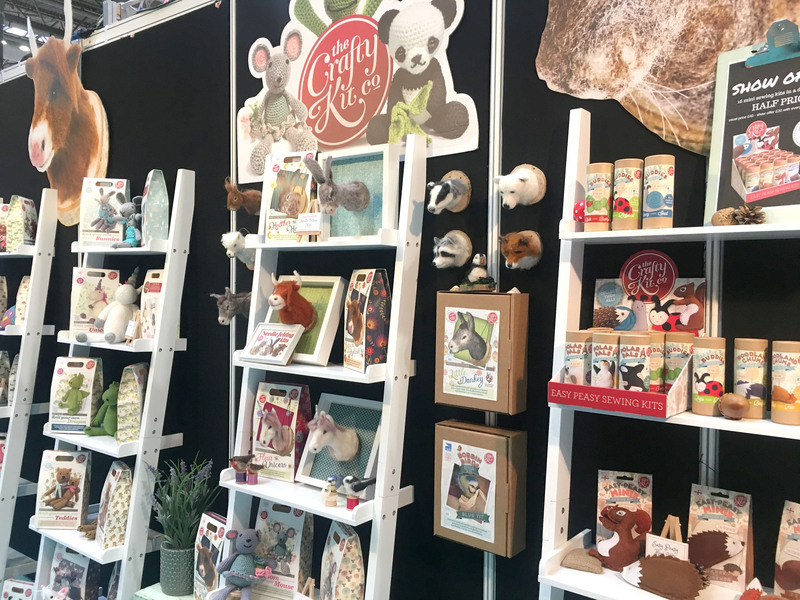 If you happened to have read my run through of CHSI 2017 last year, you’ll remember that I was a little bit disappointed that there weren’t more innovative products for contemporary crafters (a lot of the stuff seemed quite dated and behind-the-times if I’m honest) but this year was soooo much better. 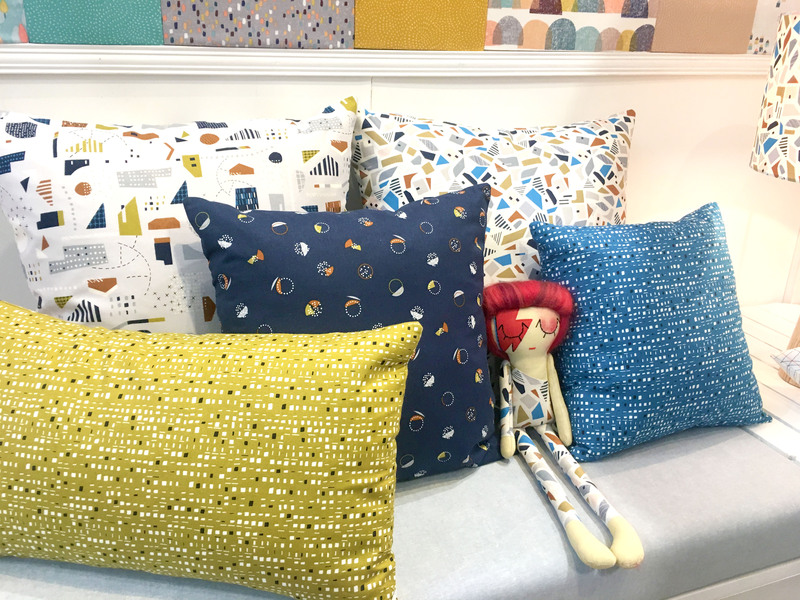 Below are some of my highlights from CHSI Stitches 2018 – I hope you find them as interesting and inspiring as I did. p.s. Full disclosure, I’m a sucker for modern makes and I love a good kit! 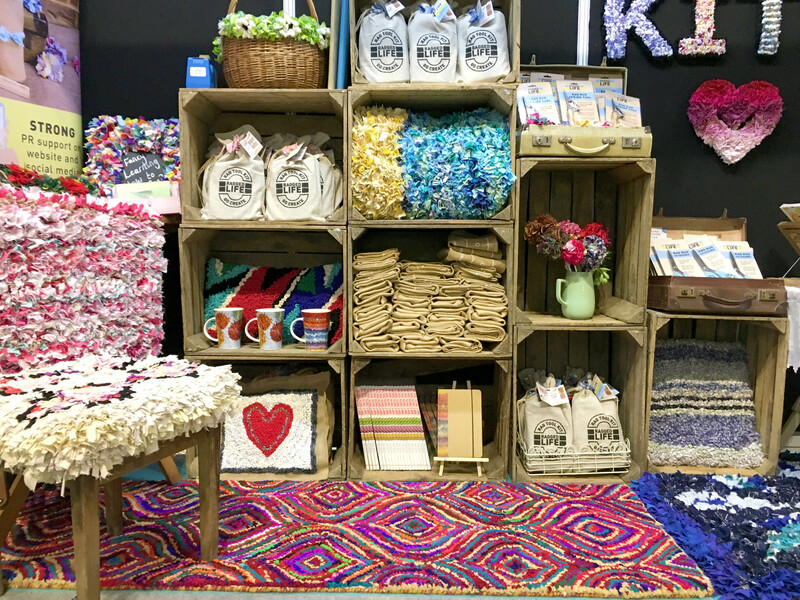 Our Ragged Life rag rug stand in all its colourful glory! 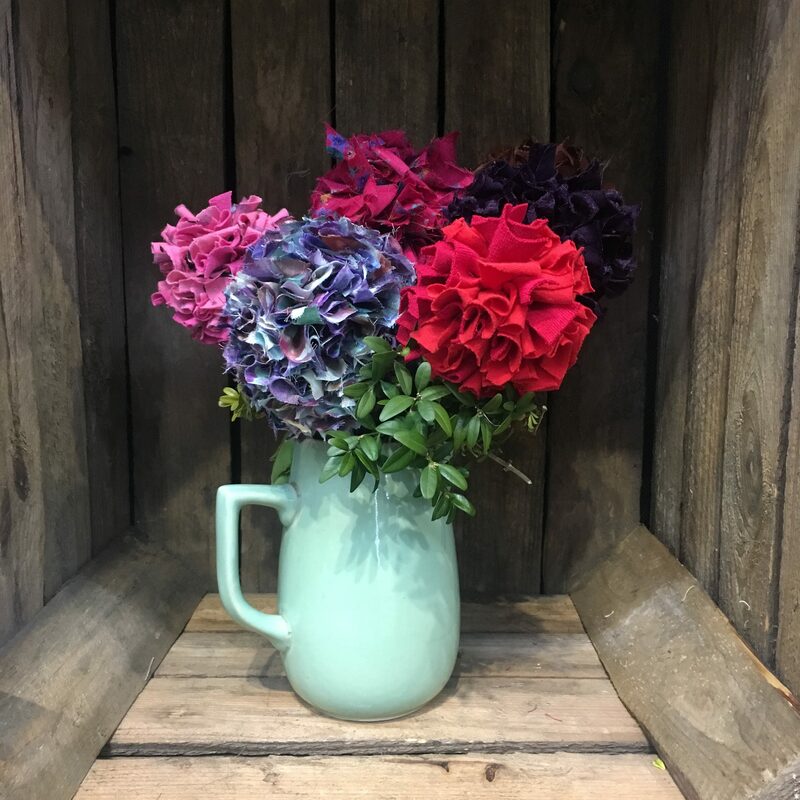 We had plenty of goodies with us like our new rag rug bouquet of flowers and heart shopping bag. 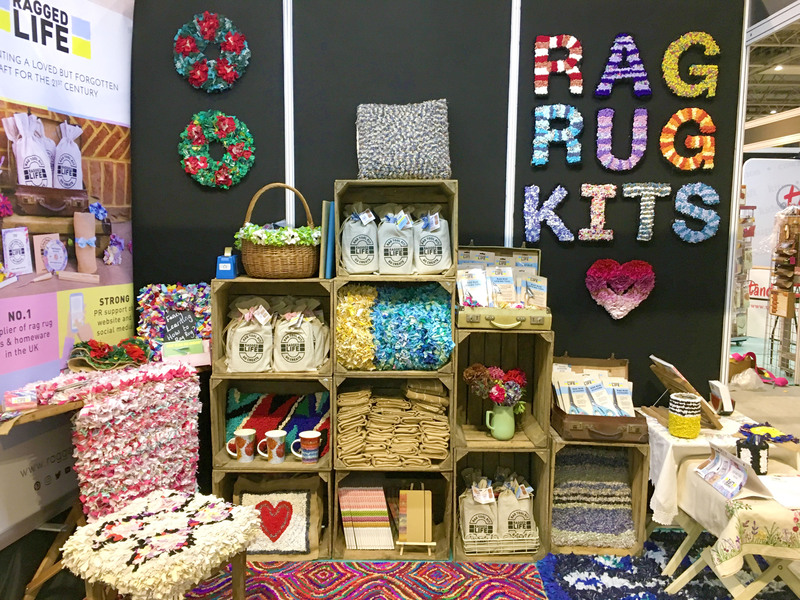 Our new Rag Rug Bouquet went down so well at the fair that we actually had to launch a kit off the back of it! You can find the kit here. Ruth always makes the shelves to hang all her kits on – serious kudos for DIY skills! 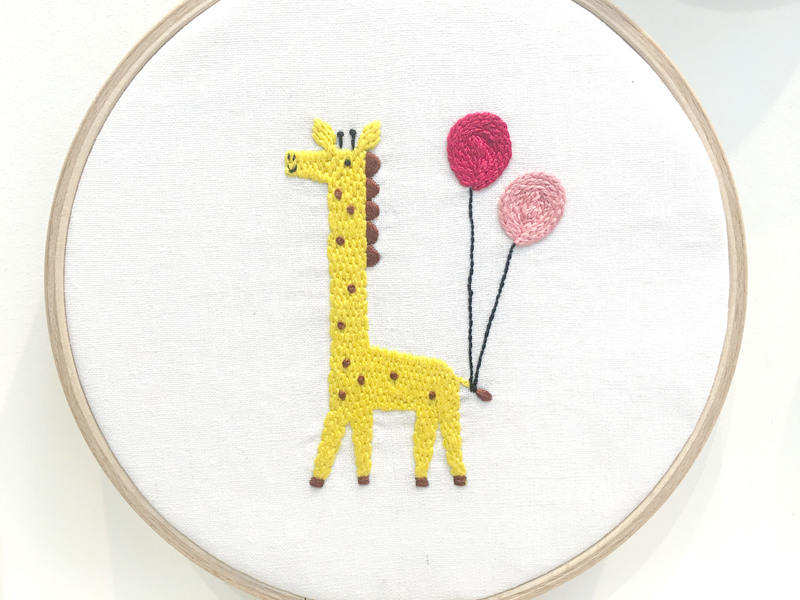 Ruth’s designs are sooo cute – I particularly liked the modern cross stitch kits. 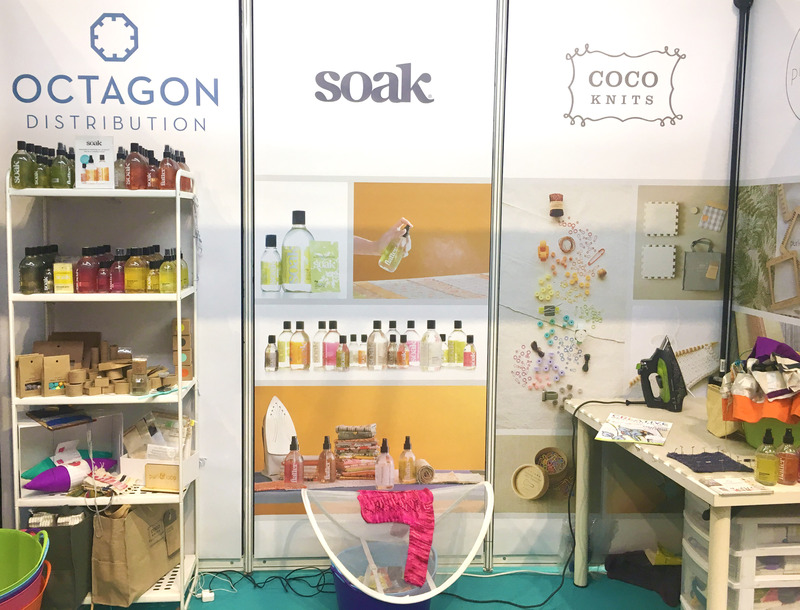 The lovely ladies at Octagon had lots of nice products that they’d sourced from the USA. 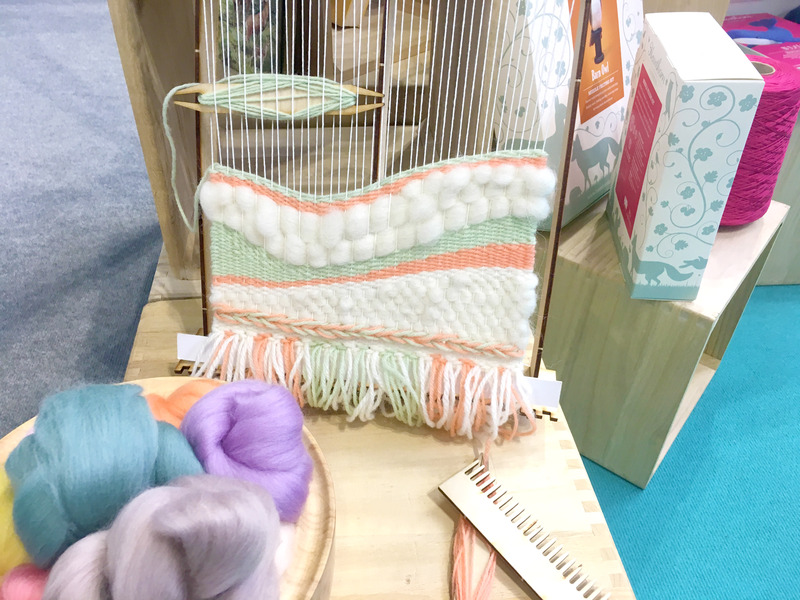 The first product that I was super excited about was their Minute Weaver from Purl and Loop. 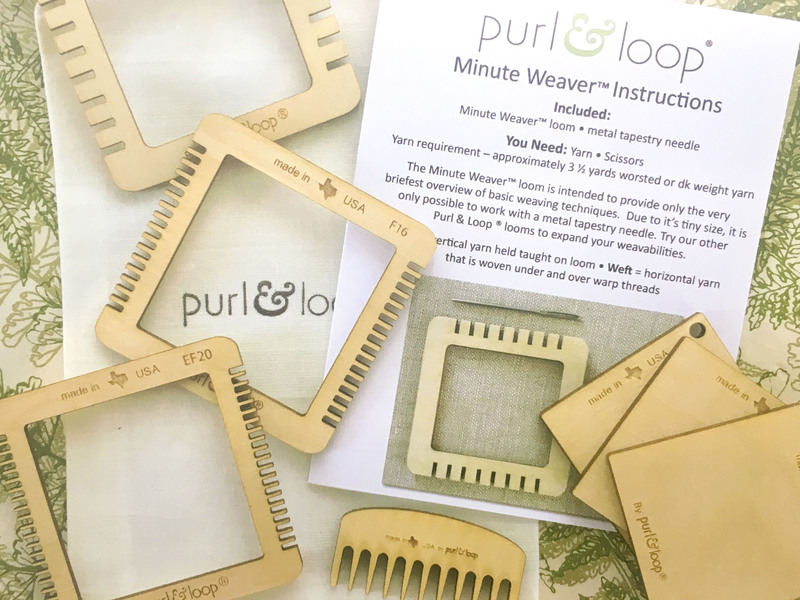 It was a tiny little weaving loom designed to self teach the very basics of weaving in 30 minutes or less. I think I may well invest in one of these to make some woven rag rug swatches – so cute! I really wanted to have a play on this Purl & Loom Minute Weaver. 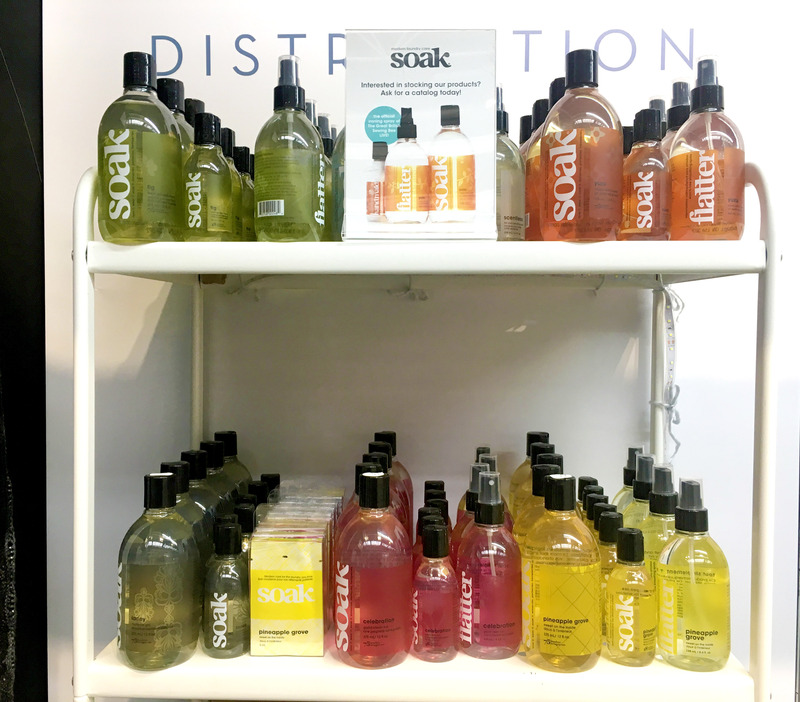 Another great product from our next-door neighbours was their “Soak” range from Canada. Soak is modern laundry care from all the delicates you care about most (like handknitted items, quilts and felt products), but I was particularly impressed by their Flatter spray, which completely flattened cottons so they didn’t need to be ironed pre-sewing. Carmen showed me how to finger press a piece of cotton perfectly. I like that handy cheat! 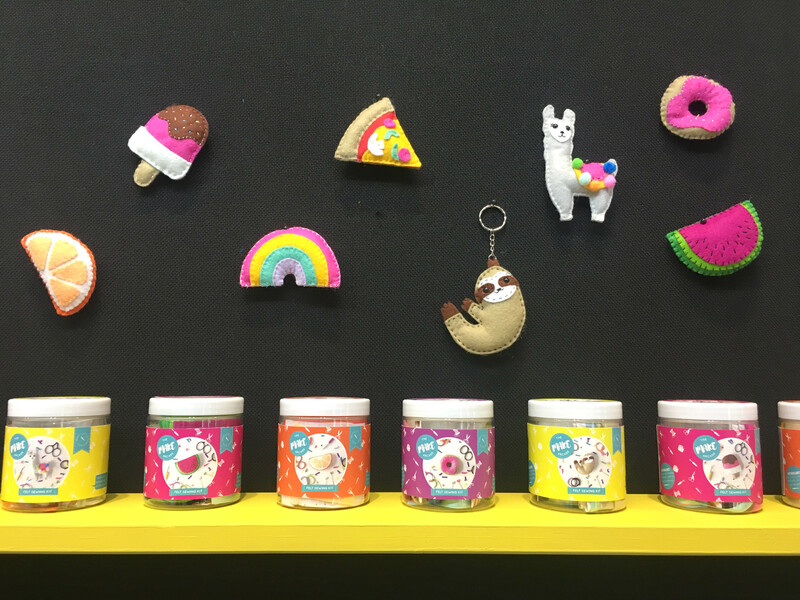 I’m a sucker for good packaging and these Soak products look colourful and pretty. 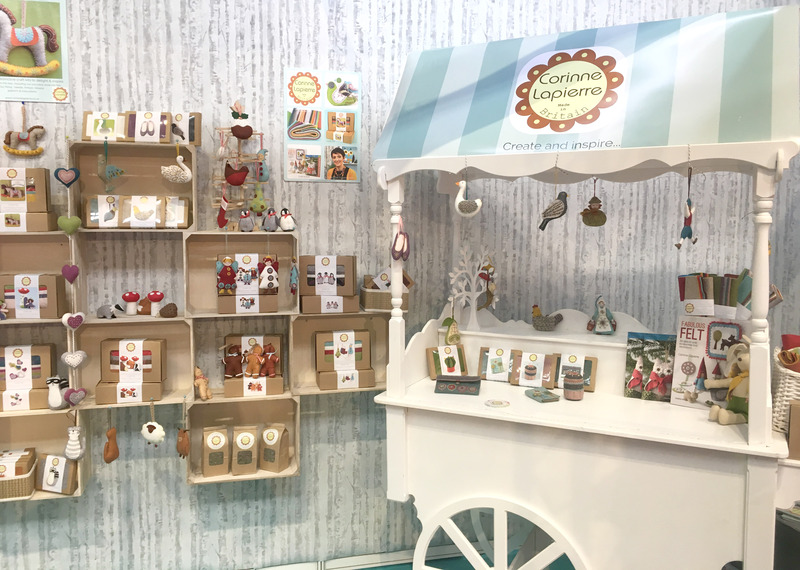 Another familiar face from last year was Corinne Lapierre who makes the most adorable felt kits. 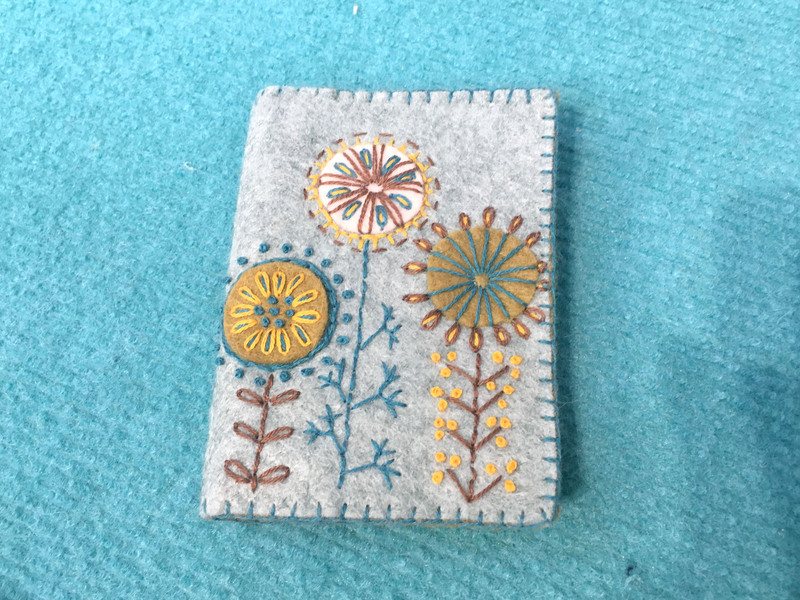 She had a few new products this year including some wool felt embroidery kits, which you can see some photos of below. Corinne was really sweet and let me borrow her steps to put my rag rug bunting up. 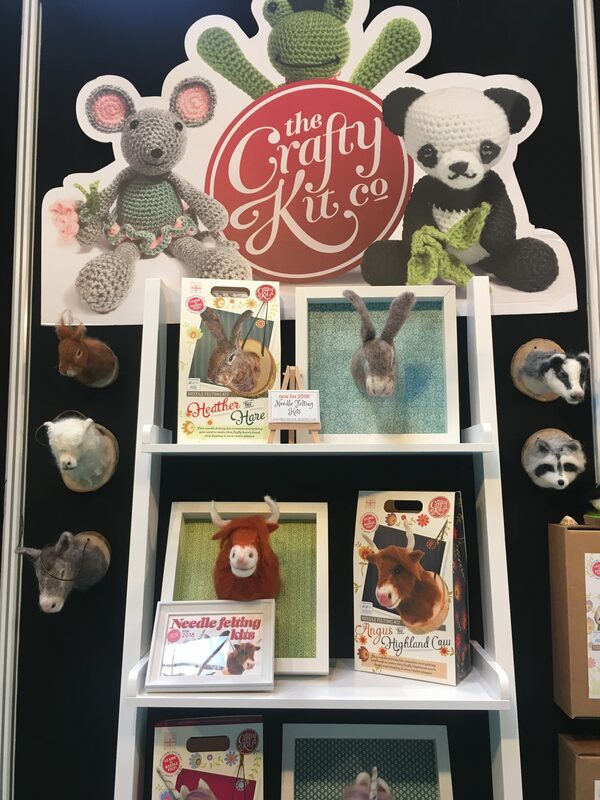 Corinne has a whole selection of different kits to make cute felt creations. 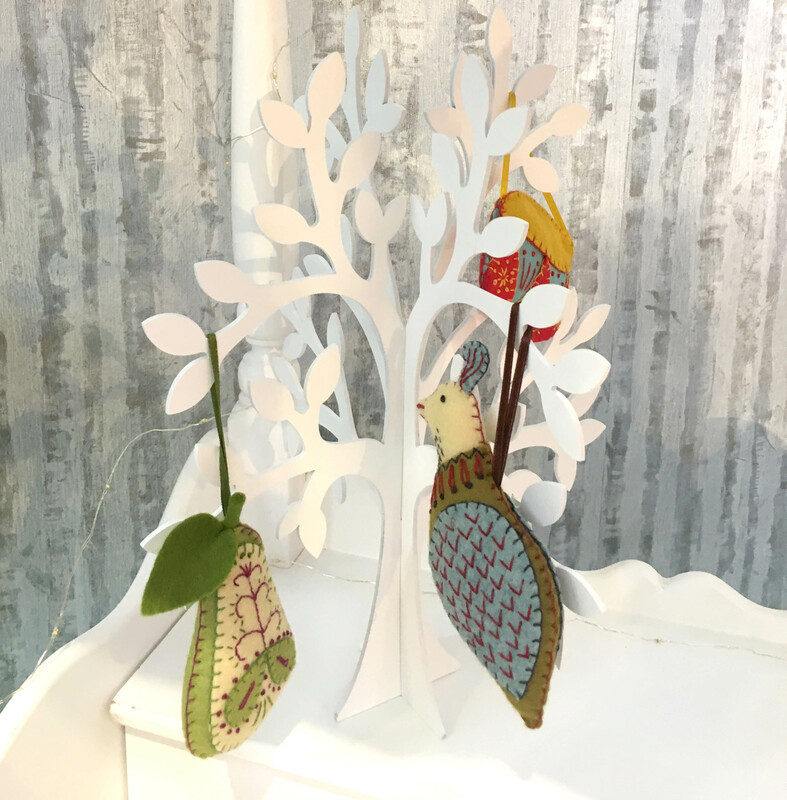 My mum absolutely loved the partridge and the pear tree projects – potential mother’s day gift? 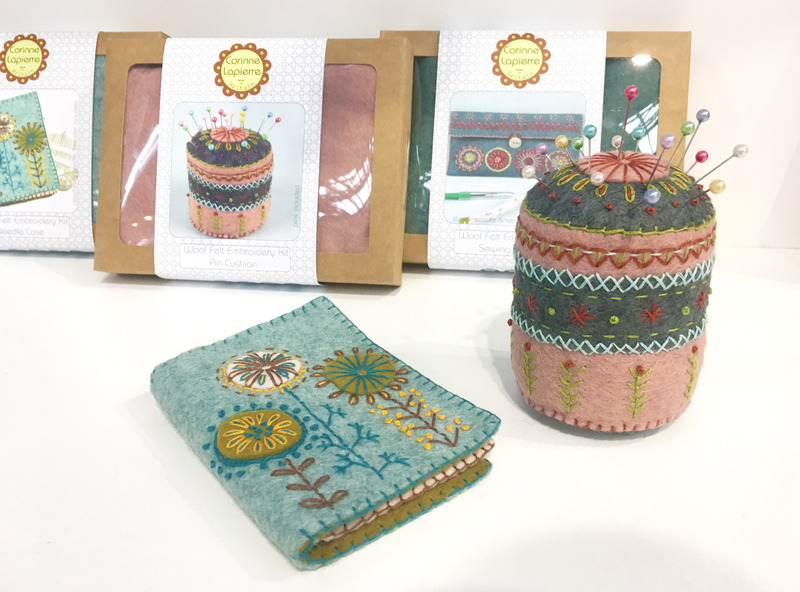 Corinne’s new products were mainly wool felt embroidery kits. I really liked her needle case and pin cushion. And here’s a close up shot of the needle case – I think I could just about manage to do that. Also in the Bright Sparks area was Un chat dans l’aiguille from France. 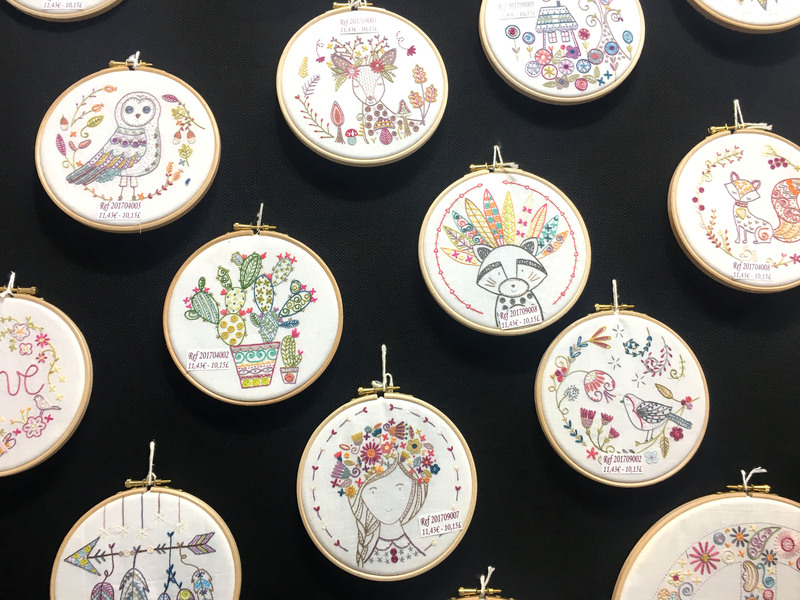 There were quite a few embroidery kits at the show but these French designs really stood out to me as being original and fun. Comment below to let me know which one’s your favourite. 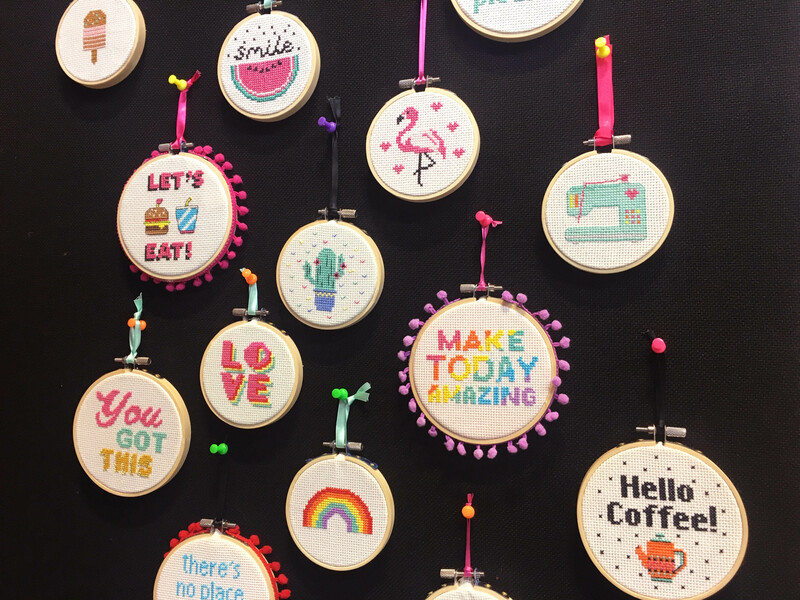 I would happily while away the hours making a whole series of these cute embroidered hoops. One of the ladies demoing the stitches. 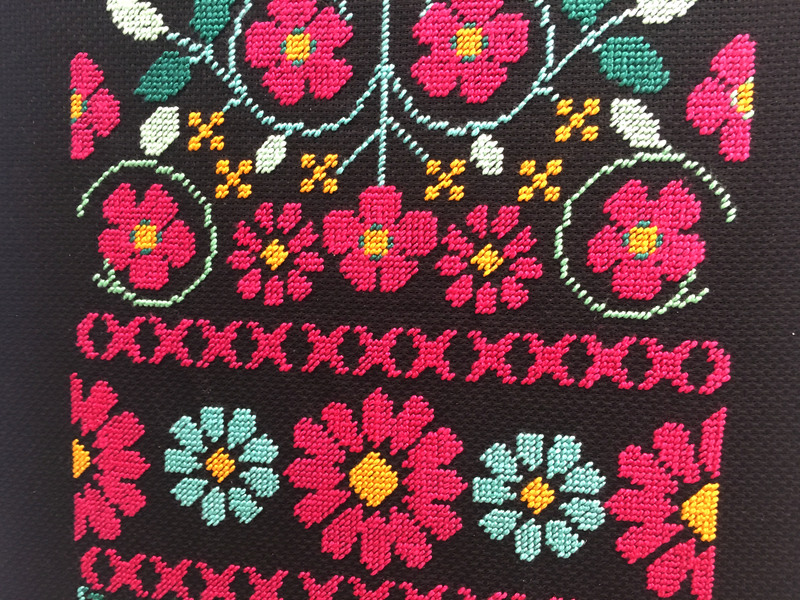 Even their tablecloth had lovely embroidery on. 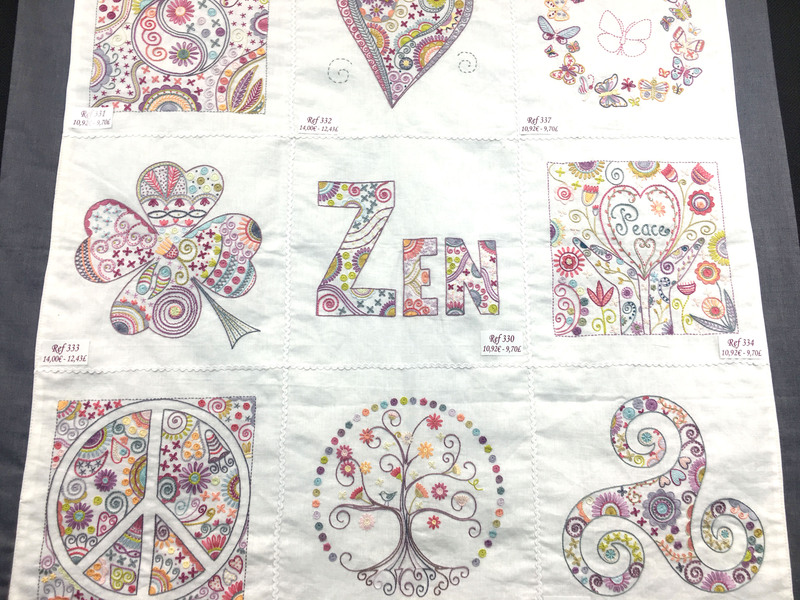 These designs were a little more hippy but I couldn’t stop staring at them – just look at the detail! 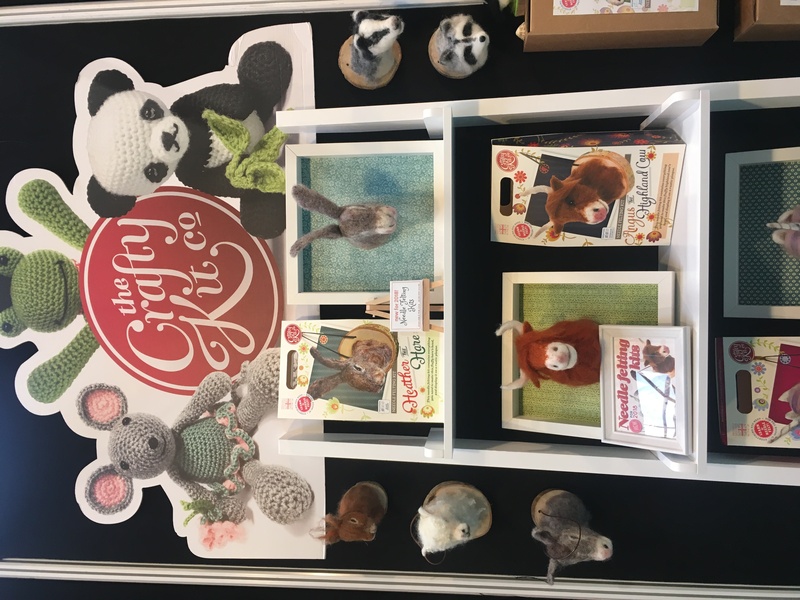 Although I don’t do needle felting, I particularly liked the needle felted badger and Highland Cow. Who could say no to that cuddly cow? 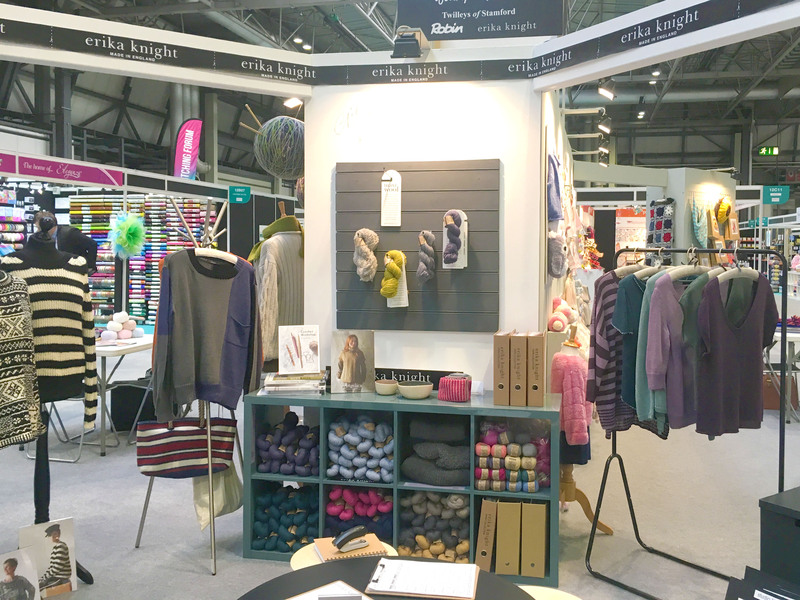 And now a bit of wool for all you knitters and crocheters out there 🙂 My first pit stop was to the Erika Knight stand. I was wearing my Erika Knight puff stitch snood so I wanted to go over there and show it off (I don’t often crochet so it’s something I’m quite proud of). 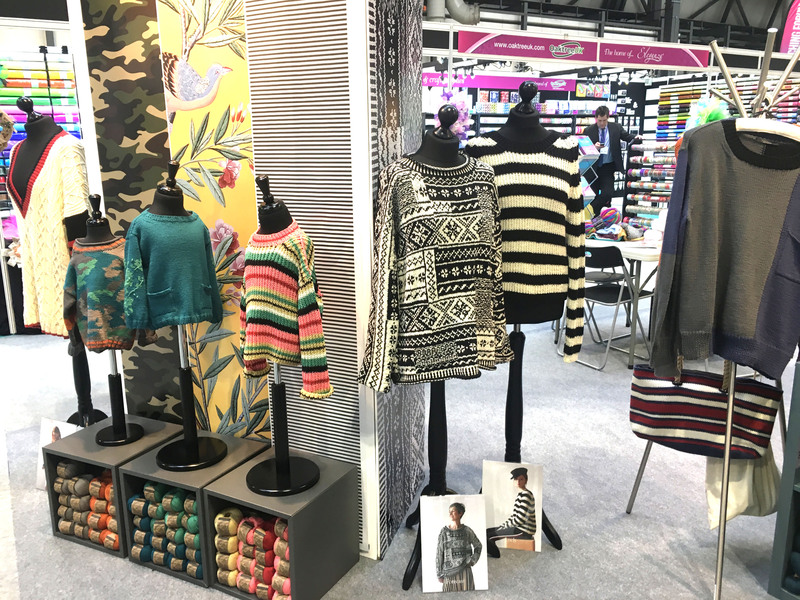 Unfortunately everyone at the stand was a little busy so I couldn’t get the inside track on what new patterns she’s launching this year but I did manage to get a couple of shots of some of her wool and knitwear. I love love love the complicated black and white jumper in the photos below. The Erika Knight reps were all a little busy while I was there but I took a couple of sneaky pics of the stand. I really liked the jumper in the centre of this photo – it looked quite retro, but cool. 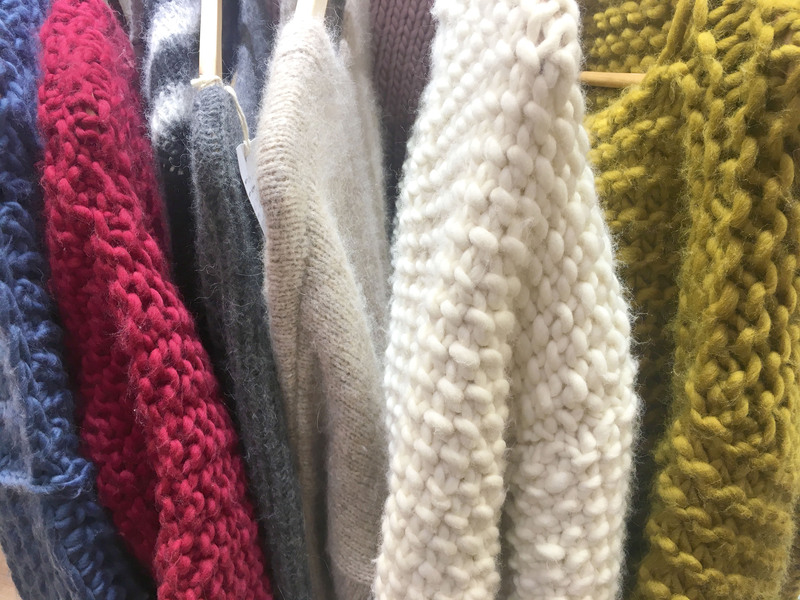 I have a real soft spot for Rowen wool as I’ve grown up with my mum’s back-catalogues of Rowen knitting patterns (she has so many that she could start a knitting pattern library). 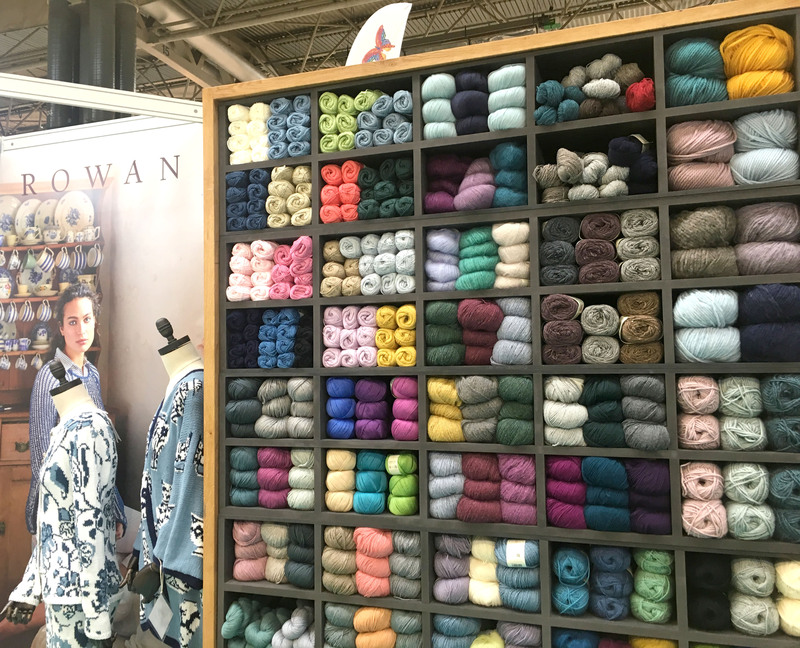 I always make it a point to visit their stand and gawk at their wool (yes, I should really get a life). 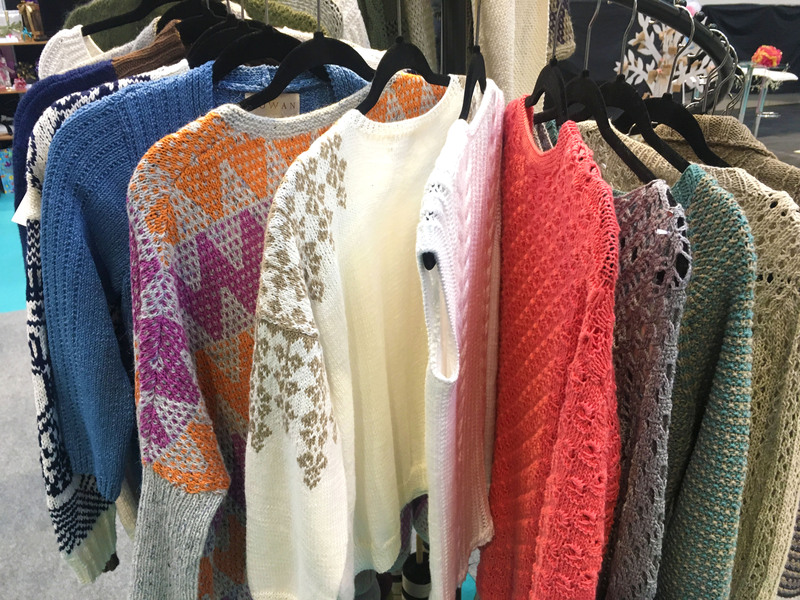 Doesn’t that display of wool just make you want to feel it! One of the nice things about these shows is that you can actually see all the patterns made up. It’s times like these that I wish I was better at knitting. It’s my mum, Victoria, who is the master knitter – perhaps I’ll have to commission something from her for Christmas. One of their latest designs was this gorgeous Eshana shawl by Lisa Richardson. You can find the pattern in Rowen Knitting and Crochet Magazine 63. One of my highlights from the show was the DMC stand. 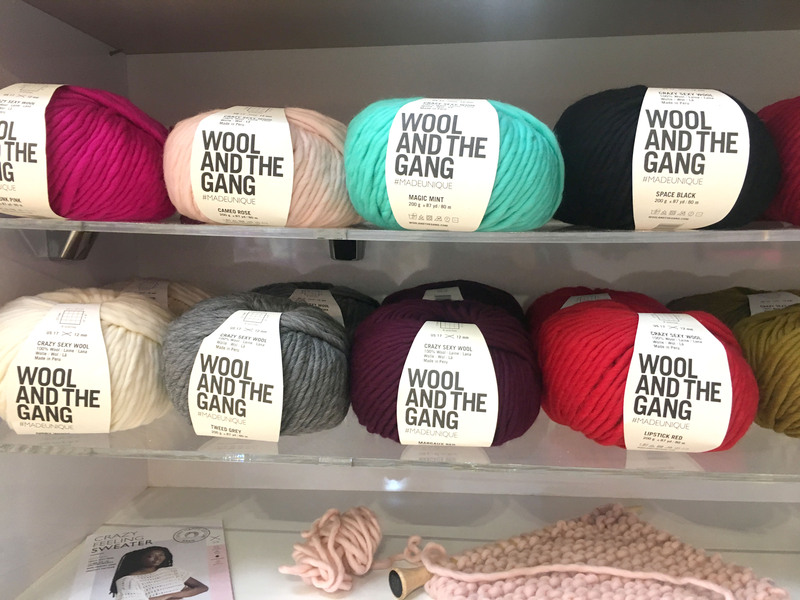 I was initially enticed by the colourful Wool and the Gang wool, which looked so soft and cosy, but it was actually some of their other products that truly impressed me. 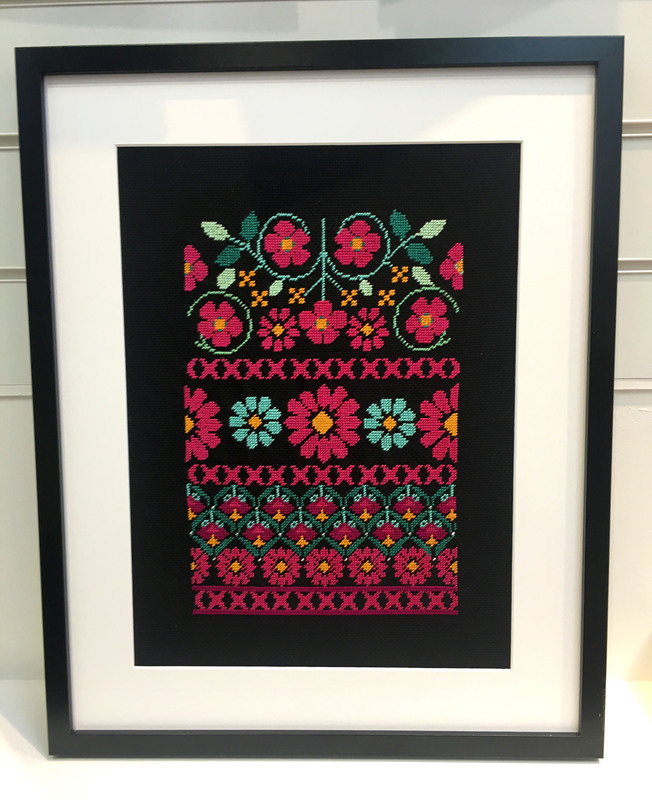 Anyone who has been on Instagram lately will have noticed a huge trend in embroidery – in particular, detailing of clothing. 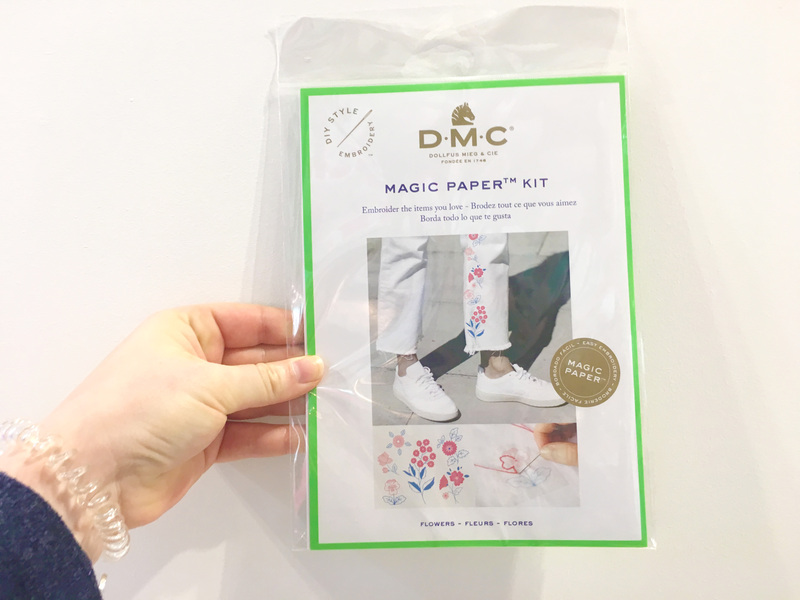 Well DMC have invented easy-to-use Magic Paper Kits so you can upgrade a pair of old jeans into something more unique. 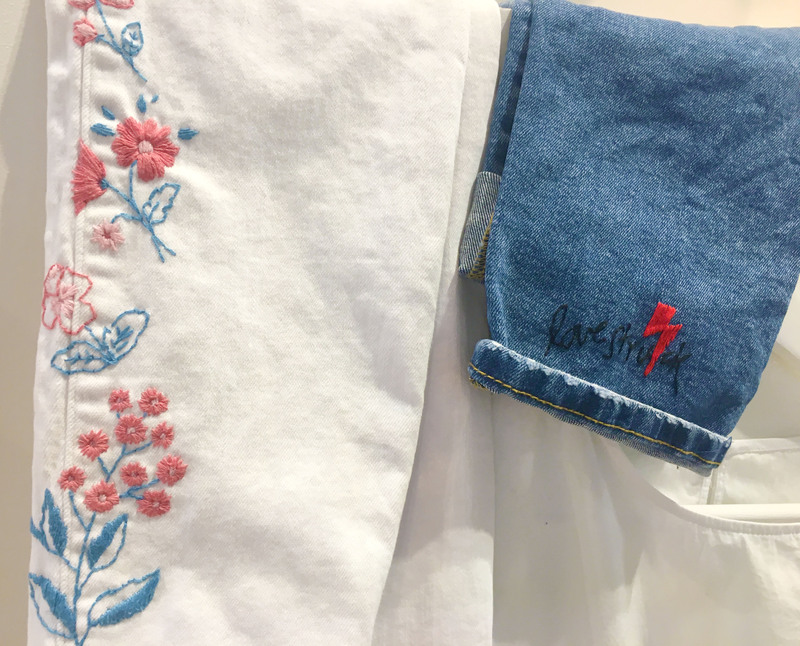 I loved the flower embroidery on the white jeans on the left and the kit looked so easy to use. It had transfer paper, all the thread and everything. This could be a great bank holiday weekend project. 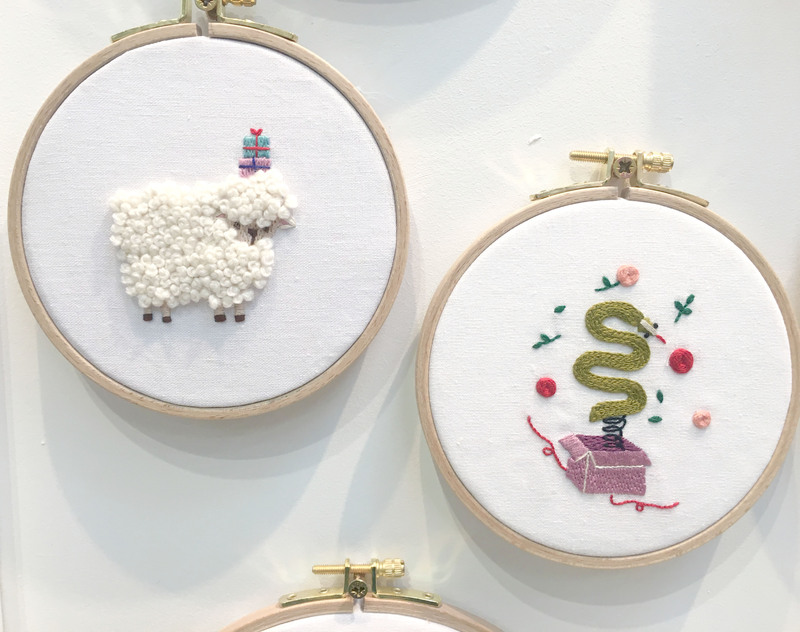 I’m really enjoying pretty embroidery at the moment and these pieces caught my eye. This is what the embroidery pack looked like from DMC – it had easy transfers and everything. 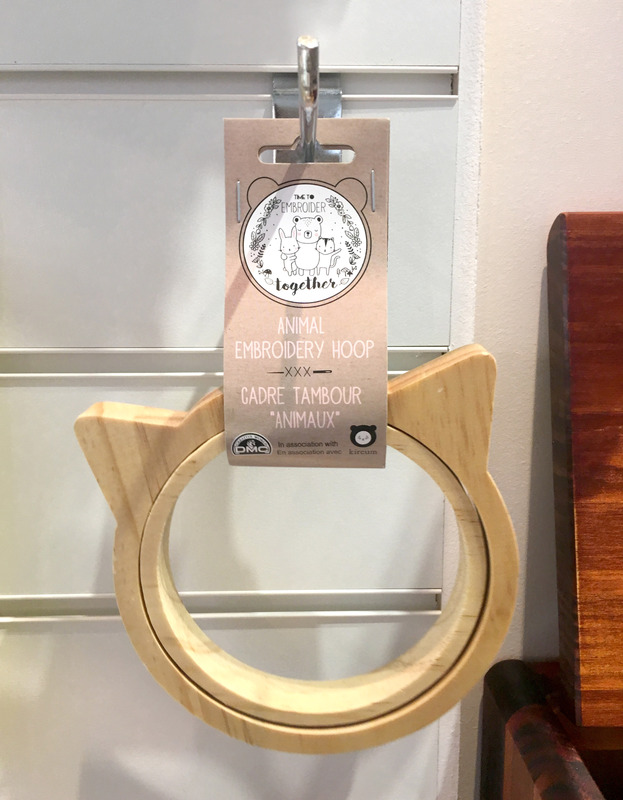 This cat embroidery hoop gave me a giggle – how fun! They also had a bunny one if cats aren’t to your taste. I’m not normally one for cutesiness but this cat shaped embroidery hoop was pretty neat. I was advised that it was mainly for displaying pretty embroidery, not for using to do it. Once again, at DMC I found these adorable embroidered animals. These would look so sweet in a kid’s bedroom. I particularly liked the texture of the fluffy sheep! The flowers really stood out against the black. When I have the time, I always make a point to pop round to Tilly and the Buttons to see what’s new in the world of dressmaking. The ladies at the stand were so lovely and helpful. They talked me through their latest pattern “Mila”, which is to make a pair of snazzy dungarees. I don’t really have the body shape to pull off dungarees but maybe some of you are more daring than I am? It’s always nice to pay a visit to the guys at Tilly and the Buttons to see which new patterns they have. 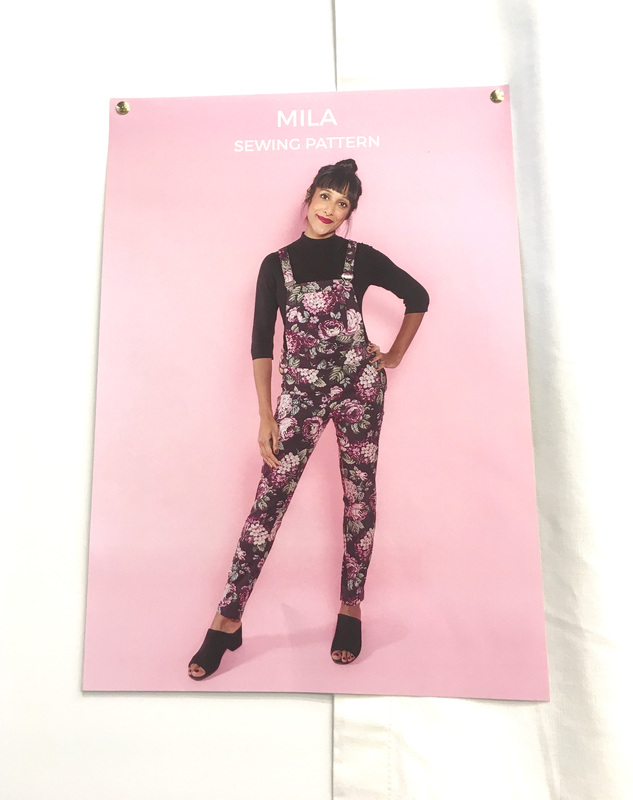 Their latest pattern – Mila. My next stop was Lewis & Irene – a British, family run business designing and making fabulous cotton quilting fabrics for shops across the UK. I was stopped in my tracks by the Lewis and Irene stand which had an actual car on it! They also had the lovely handmade fabric tree and rag rug below. 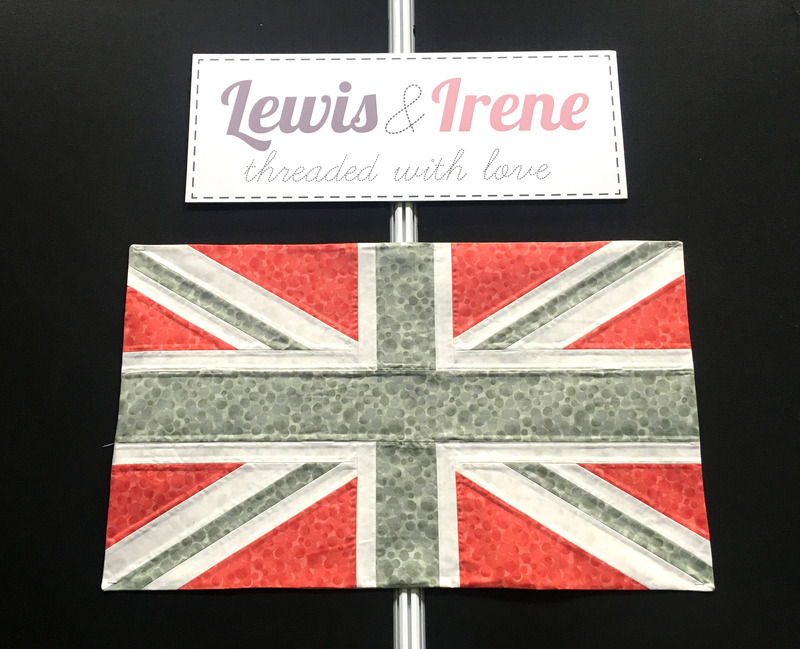 Lewis and Irene are an old British supplier of fabric. 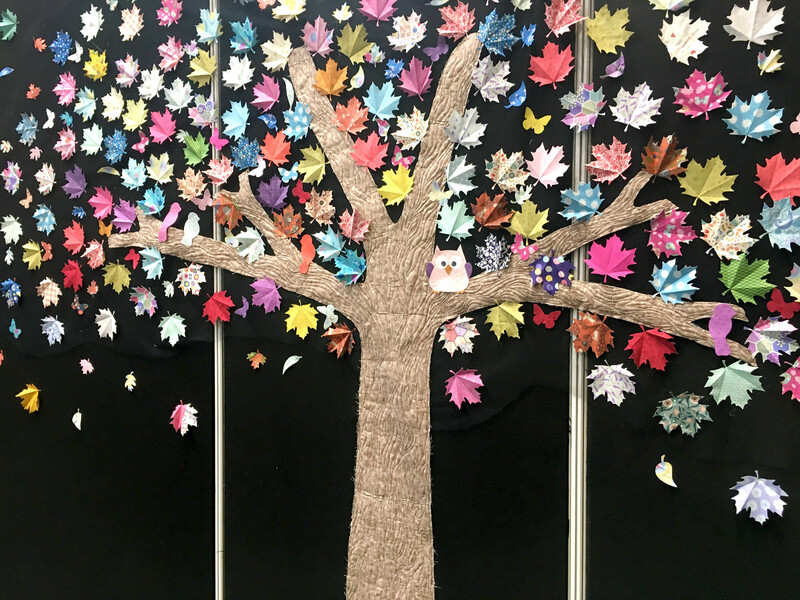 I was initially enticed to the stand by this giant fabric tree with leaves of different fabrics. 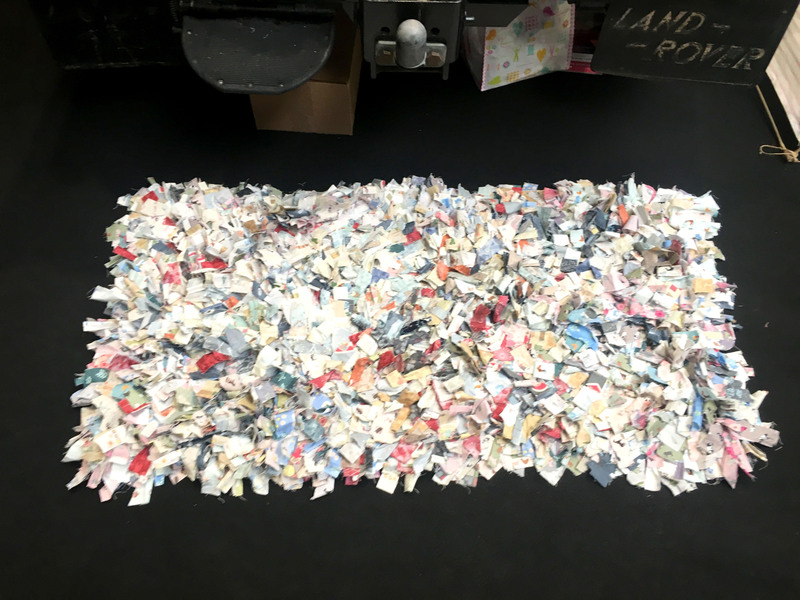 This was the only place I came across another rag rug. 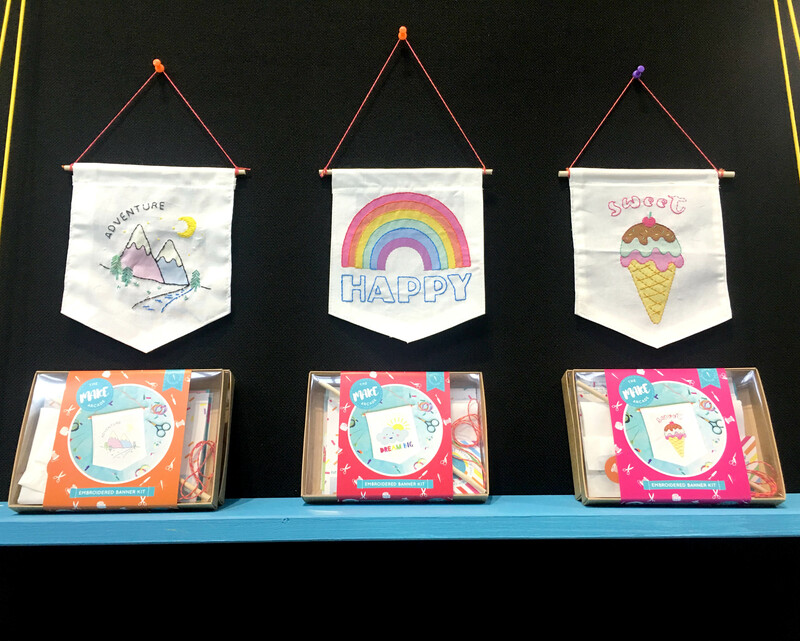 CHSI Stitches always has a new product showcase at the entrance. 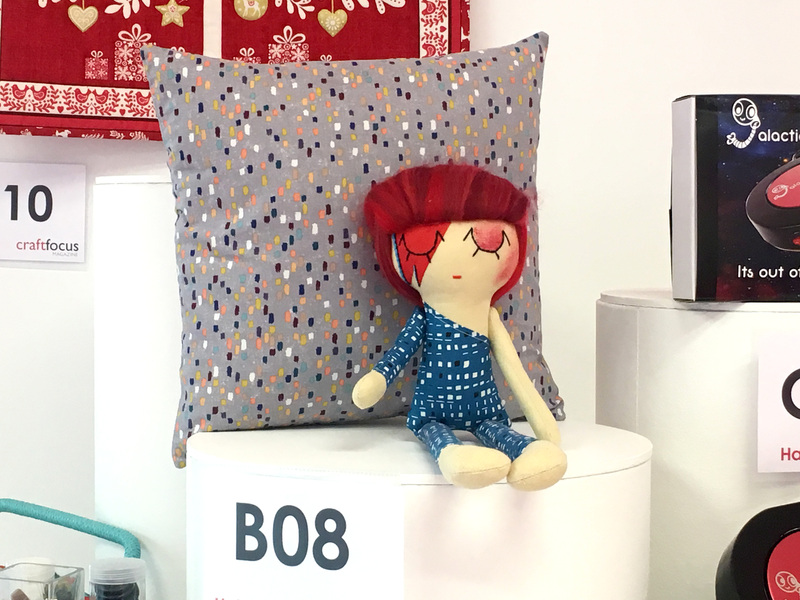 After I spotted this hilarious handmade Ziggy Stardust doll, I just had to go visit Dashwood Studios on stand B08. 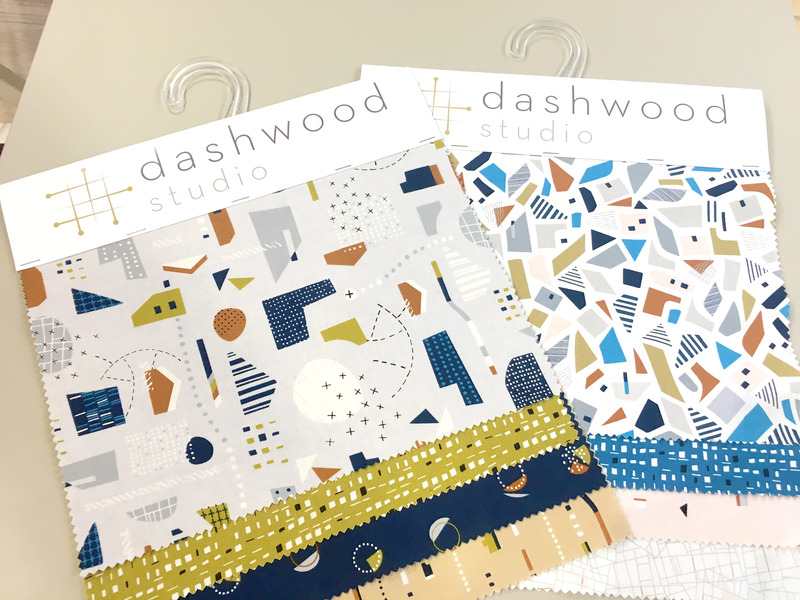 I first decided to visit Dashwood Studio after seeing their cute Ziggy Stardust in the new products area. 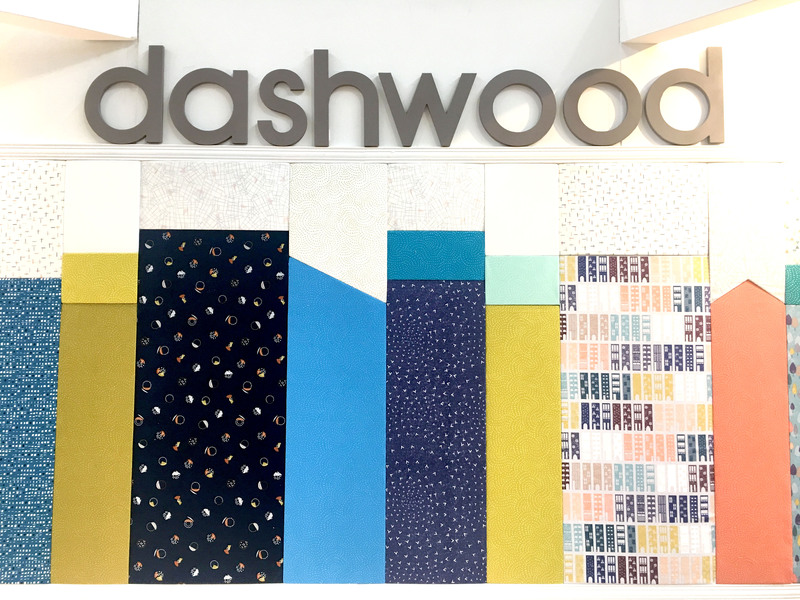 Even the Dashwood sign was cute! They’re not necessarily colours that I would have put together, but they work. 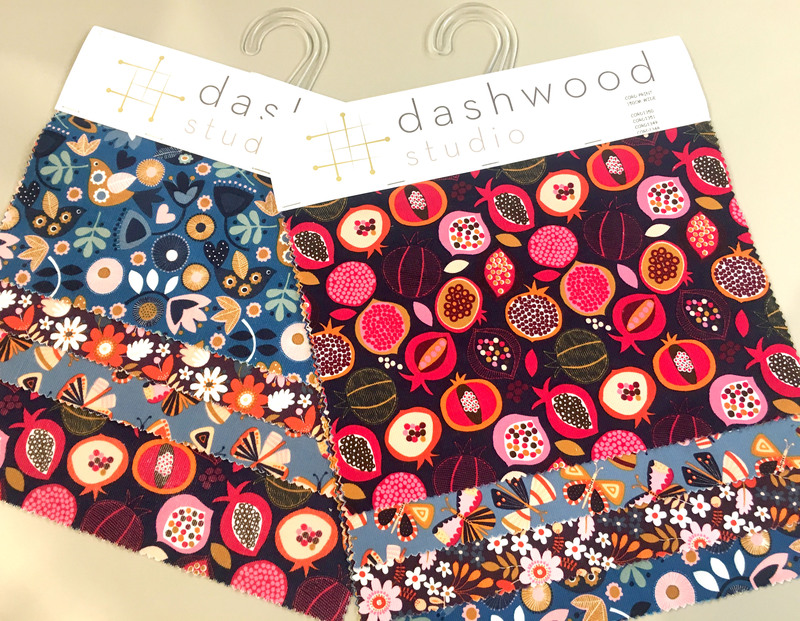 Here are some of their new fabrics… I like that they’re quite modern and sleek. And here are their new corduroys, which I was strangely excited about despite the fact that I don’t make clothing! 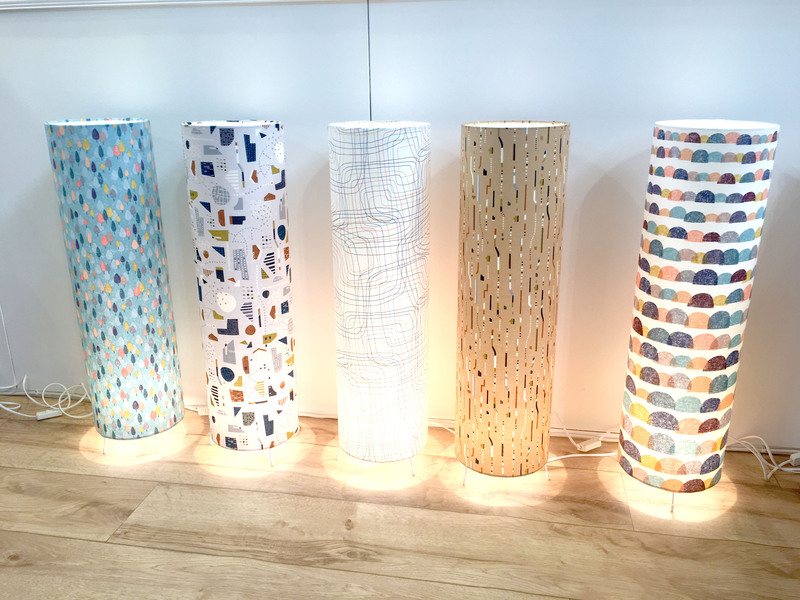 I thought their lamps were particularly cute and showed the fabrics off nicely. I love exploring what new craft books are out at these fairs, but sometimes I’m just overwhelmed by the choice. I had a bit of chat with the men on the GMC Distribution stand about Kaffe Fassett‘s books. I didn’t know quite how many he’d actually done but the “Bold Blooms” cover drew me in. 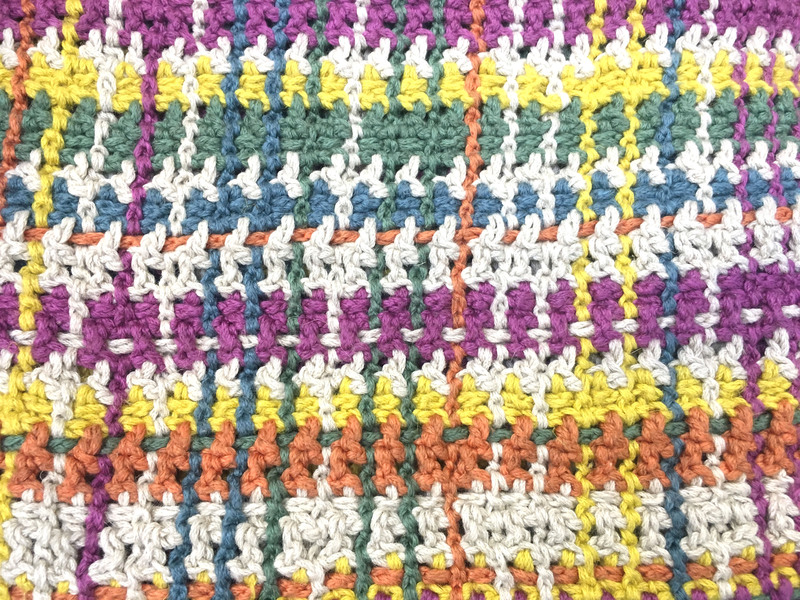 Not many people know that Kaffe actually used to make rag rugs – they’re pretty complicated though! 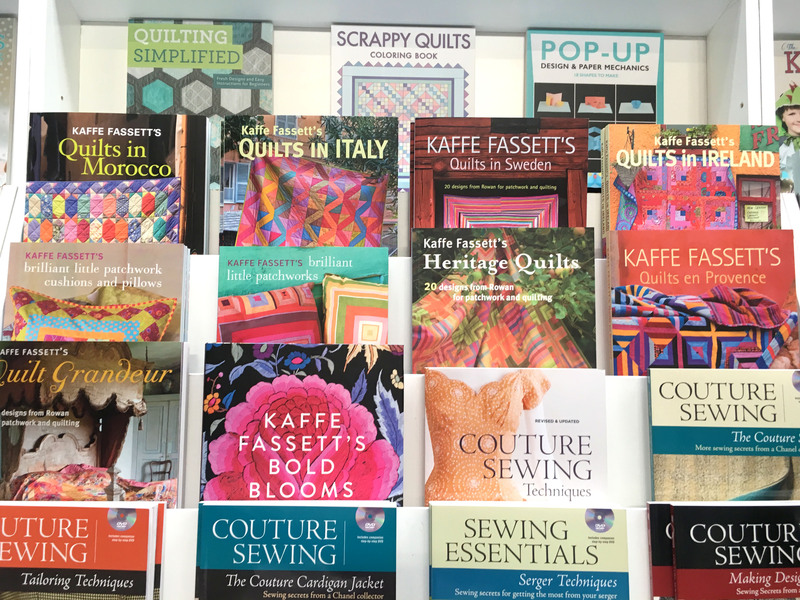 So many gorgeous Kaffe Fassett books to gawk at! And last, but not least, I popped over to the Hawthorn Handmade stand to check out what new kits they have. 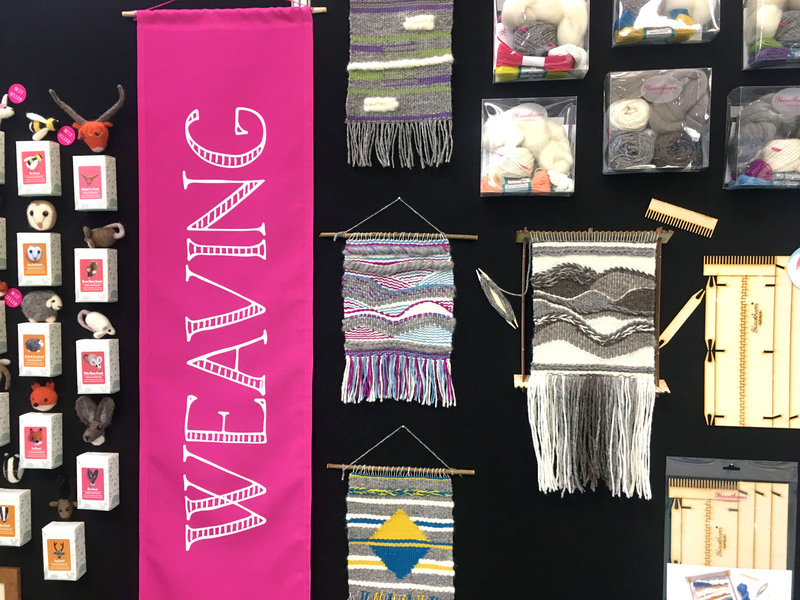 They had a whole new weaving range, which looked like a lot of fun. I’ve been meaning to get my loom out for a while to get back into weaving but these cut kits are a good starting point. And they’d expanded their embroidery range to include these new floral patterns, which looked whimsical. 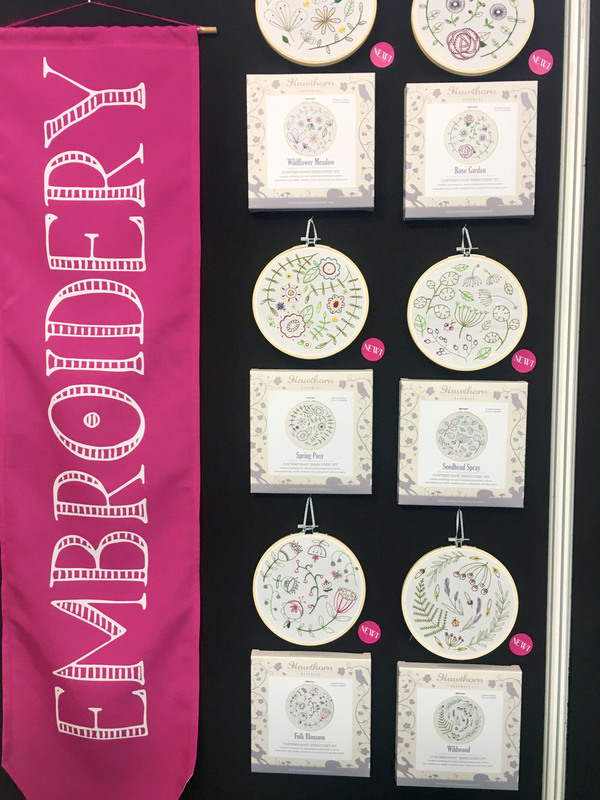 Hawthorn also make cute embroidery kits like these ones. 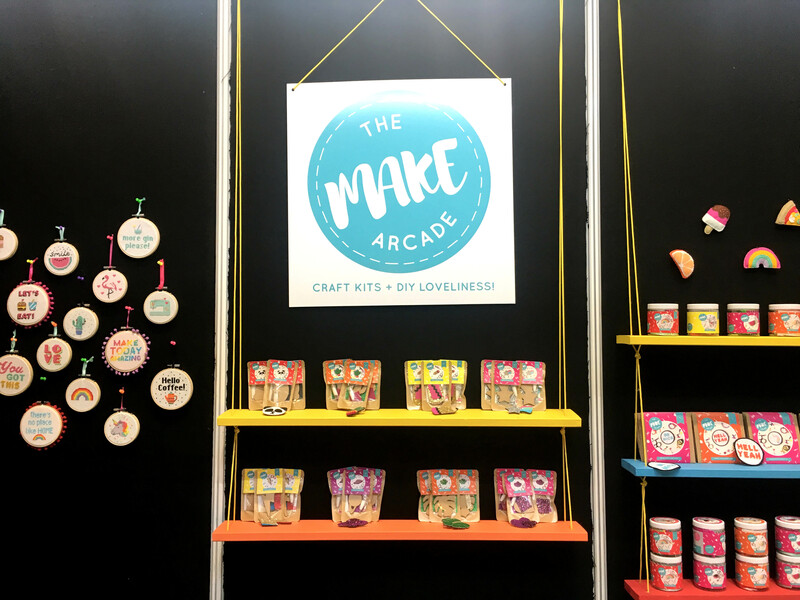 This entry was posted in Craft Fairs, Workshops & Fairs and tagged 2018, Fairs & Shows, Other Crafts. Bookmark the permalink.